Athens, GA (Sept 21, 2008) - The ESPN College Gameday crew is coming to Athens, Georgia for the September 27 battle of SEC undefeated teams, as 8th-ranked Alabama(4-0, 1-0 SEC) takes on 3rd-ranked Georgia (4-0, 1-0 SEC). ESPN likes to have the stadium as the backdrop for its set. They were able to do that by setting up on the roof of UGA’s Tate Student Center on the crew’s last visit for the Tennessee game in 2002. But growth over the years now requires three tractor trailers to move the show around the country, and with new building construction around Sanford Stadium, it’s almost out of the question. Georgia has proposed the Reed or Myers Hall quadrangles but neither offers a stadium vista. Thanks to Ken Fang of Fang's bites for pointing out Chip's story. Because both of the quadrangles are "off the beaten path" so to speak, it is unclear at this point how ESPN will set up the stage. CSTV set up their SEC Pre-game show on the Myers Quad last November, and it was hard to find a large number of exuberant fans for the "backdrop" of some parts of the show. 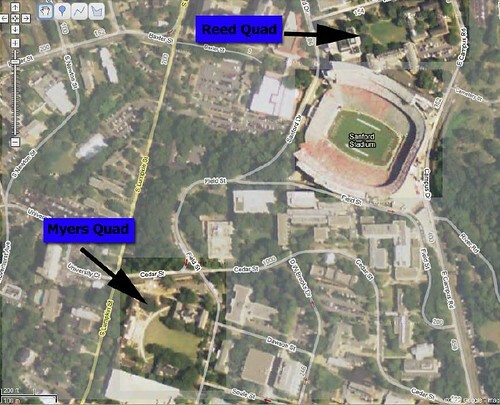 The Reed Quad is closer to more pre-game pedestrian "traffic" and is closer to the stadium, so that might work out better.